Now is the time to book a classic fall Canada & New England cruise and take advantage of savings and extras with Princess Cruises Anniversary Sale! This sale only happens once a year and includes complimentary gratuities and up to $800 Onboard Credit (between $50-$100 per person based on cruise length and stateroom booked and includes up to four guests in a stateroom). Receive $50 per person Onboard Credit for Interior/Ocean View Categories and $100 per person for Balcony/Mini-Suite/Suite Categories on this sailing. Book by Dec. 31, 2018! 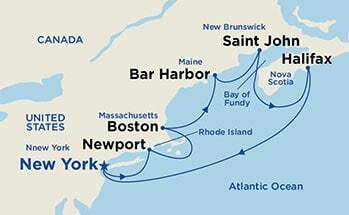 Sail roundtrip New York City and visit these charming ports in prime fall color season: Newport, Rhode Island; Boston, Massachusetts; Bar Harbor, Maine; Saint John; and Halifax, Nova Scotia. From your ship’s balcony, relax and enjoy the spectacular views such as glorious colors, and you’ll realize this experience can only happen along the stunning and dramatic coasts of Canada and New England. The pages of history and stunning natural beauty blend seamlessly as you cruise the color-drenched shores of Canada & New England with Princess. Visit the iconic lighthouse at Peggy’s Cove in Halifax, return to the Gilded Age in Newport and stroll down Boston’s historic Freedom Trail. Or ascend Cadillac Mountain in picturesque Acadia National Park for one of the “Best National Park Experiences,” according to Lonely Planet. On board, you’ll dine like a New Englander on succulent crab cakes and lobster as the allure of the northern seaboard embraces you — and leaves you changed forever. Oct. 12, 2019 Sat. New York City (Manhattan or Brooklyn) 5:00p.m. Oct. 13, 2019 Sun. Newport, Rhode Island 7:00a.m. 5:00p.m. Oct. 14, 2019 Mon. Boston, Massachusetts 11:00a.m. 8:00p.m. Oct. 15, 2019 Tues. Bar Harbor, Maine 7:00a.m. 7:00p.m. Oct. 16, 2019 Wed. Saint John (for the Bay of Fundy), New Brunswick, Canada 5:00a.m. 4:00p.m. Oct. 17, 2019 Thurs. Halifax, Nova Scotia, Canada 9:00a.m. 6:00p.m. Oct. 19, 2019 Sat. New York City (Manhattan or Brooklyn) 7:00a.m. Above price is per person (1st & 2nd), based on double occupancy, availability and subject to change without notice. Other sailing dates and cruising destinations are availability upon request. Offer is for new bookings only booked by December 31, 2018 and travel between Spring 2019 through Spring 2020. All sailings do not apply. Taxes and Fees are additional at approximately $210 per person. Other restrictions may apply. Ships of Bermudan and British Registry.